These vehicles now manage $3.3 trln, double five years ago. Investors can pull their money out quickly, which means a rush for the exits could cause panic. Imposing redemption fees is one solution. Holding more cash and restricting rapid withdrawals would be more effective. 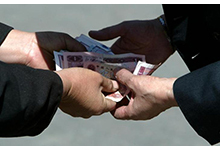 Chinese banknotes change hands at a market in Beijing. Bond funds now manage some $3.3 trillion, according to Investment Company Institute data. That represents a growth of 100 percent in the five years to March. Recently departed Federal Reserve Governor Jeremy Stein delivered a speech on Feb. 28 that addressed potential bond market disruptions that could result from a run on these funds. He said that although a fund’s liabilities are not technically debt claims, they are still demandable and investors can pull out very rapidly if an early-mover advantage exists. He suggested exit fees on open-ended funds as a possible regulatory fix.